The following QuickTime movie highlights the features in Ethno2. Click the image below to activate and play it. In all of these videos, Jordan employs Ethno's built-in mixing features to enhance the mix. For example, at the beginning of this video, notice that the percussion instruments sit wide left and right, while the vocal phrase is just to the right of center. As Jordan brings in more instruments, they blend coherently more towards the center of the mix. By the time everything is in full swing, good balance and spread is maintained overall. All of this is achieved using Ethno's built-in pan, volume, EQ and synth engine features. You can also employ multiple separate outputs to further manage Ethno's multiple instruments within the mixing environment of your host software or hardware mixer. 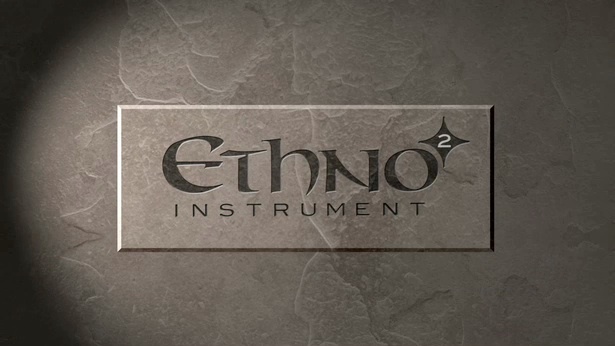 View more videos showcasing the MOTU Ethno Instrument presets. Point to an item to learn more about it. "Ethno 2 should be at the top of your list. With a Key Buy award, it's sure at the top of ours." "Ethno 2 is fantastic by the way, had a little play today, it sounds really vibrant and organic!" 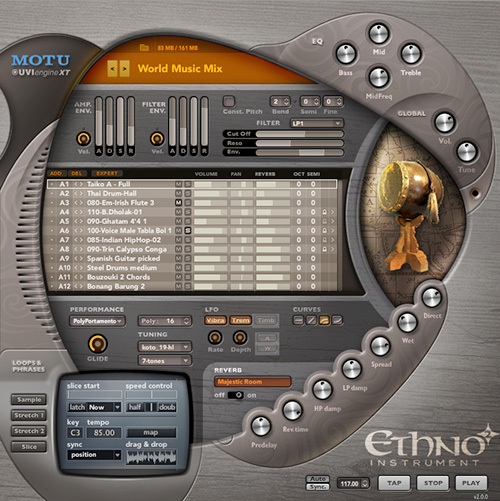 Ethno Instrument Version 2 delivers expressive ethnic instrument sounds combined with authentic world music loops and phrases in one window. This massive 21GB library delivers all the exotic textures you need to take your recordings to the four corners of the globe. Start with a huge library of multisample instruments from all over the world, recorded with pristine audio fidelity. Browse and search by category or geographic region. Now add hundreds of authentic loops and phrases, instantly tempo-locked to your host software time line. Slice loops with one click to trigger each beat from your keyboard, or drag & drop them directly into your host software tracks. Play authentic non-western tunings and scales using your favorite MIDI controller. Adjust sounds quickly with Ethno’s intuitive controls. Place your music in real acoustic spaces, from primordial caves to towering forests to remote canyons, all faithfully reproduced with stunning realism by Ethno’s built-in convolution reverb processor. Create entire songs with unlimited parts and mix them in Ethno or your host software via multiple outputs. Run Ethno stand-alone to turn your computer into a world instrument powerhouse with disk streaming and multiple outputs. Or load it as a plug-in that saves all settings with your host software sessions for instant recall. Co-producer on Michael Jackson's Dangerous album and many other multi-platinum releases, Teddy Riley is one of the most successful R&B producers of all time and is widely recognized as the father of New Jack Swing. Teddy uses Ethno in his daily work, most recently on the posthumous Michael Jackson album Michael.